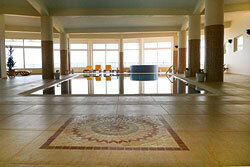 Caesar Resort is one of the best properties listed in Cyprus44 property reviews. Caesar Resort has proved to be an exceptional project. 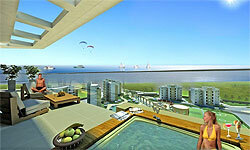 More than 80% of the apartments are sold and the available ones start from only £25,000. Dumika Construction Limited is a joint venture between three established and experienced companies from the fields of international development and construction and international financing. The three member companies are A.S. Afik Ltd., I.S.E Consulting & Directing Ltd., and the Outdoor Company Ltd. A.S. Afik Ltd are a development and construction company with interests in Israel, Turkey and Cyprus, and build their homes using Turkish construction workers. I.S.E Consulting & Directing Ltd is the holding company for Technologies Group, the largest group in Israel providing IT support. The Outdoor Company Ltd is owned and run by North Cyprus citizen Durmus Ali Kilinc. Caesar Resort in Bogaz North Cyprus offers a one-stop holiday solution for those seeking fun in the sun, or an investment opportunity in this rapidly-rising tourist area of North Cyprus. 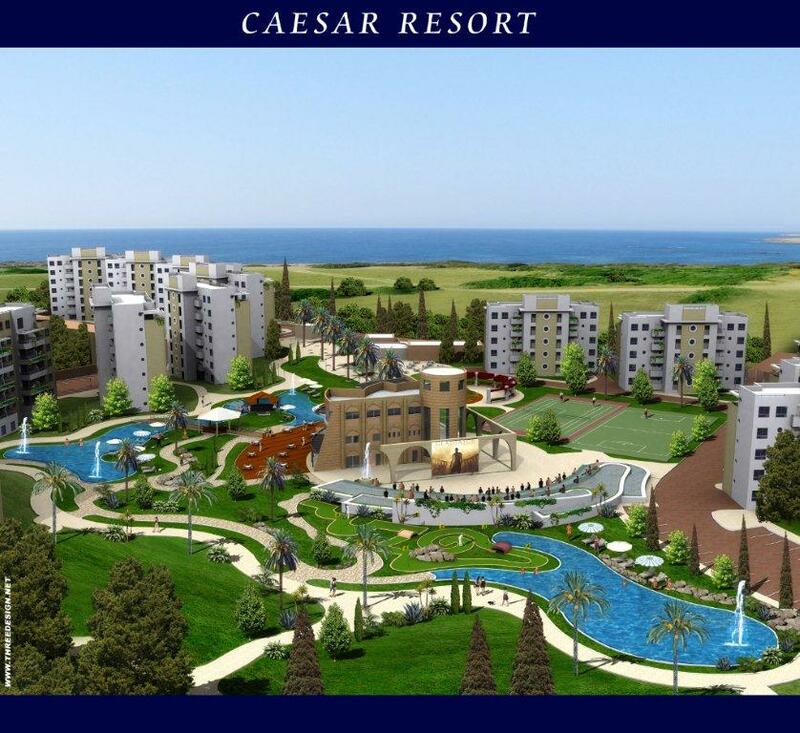 Situated just 10 minutes away from the historic walled city of Famagusta and the ruined Roman town of Salamis, the Caesar Resort's rather cheesy Roman-style logo is for once, absolutely justified! The Caesar Resort is designed in a classic holiday resort style, where every amenity is only a short walk away, and you can have a wonderfully relaxing holiday in the sunshine of North Cyprus without ever leaving the site itself. There are five types of apartment on offer at the Caesar Resort in North Cyprus, from a penthouse suite to a small studio apartment. 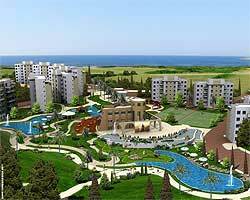 Most apartment blocks are built with five storeys, higher than at other similar property developments in North Cyprus, so it is comforting to know there is a lift in every block, and a back-up generator for the site in the event of occasional power cuts. The ground floor of the blocks features parking spaces and storage rooms, so every style of apartment has a small balcony/terrace included so you can admire the views over the sea. At just 45 metres square, the studio suites are definitely a snug fit, and even the penthouse suites retain a rather four-square feel to their design, but then again, this is a holiday resort complex. You'll be out enjoying the Caesar Resort facilities all day, won't you? Only 600 metres from the beach and coastline, the Caesar Resort in North Cyprus offers a choice of swimming pools, tennis courts, sports courts, outdoor jacuzzi, mini-golf, barbecue and picnic areas, and a children's playground. You can also get fit at the gym, get pampered at the spa or beauty salon, or even get beaten at snooker, video games and table tennis by your kids in the amusement arcade. The modern restaurant looks over the pool complex and green spaces for an enjoyable evening meal away from your apartment kitchen, and there is also a snack bar for a quick bite at lunchtime. On summer nights, the Caesar Resort open air amphitheatre will show movies; Russell Crowe in "Gladiator", anyone? 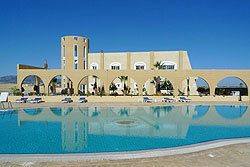 The Caesar resort, however, has one trick up its toga for any North Cyprus property investor, and it's quite an ace. Just 10 minutes drive away is the Eastern Mediterranean University, with 15,000 students and 400 lecturers. 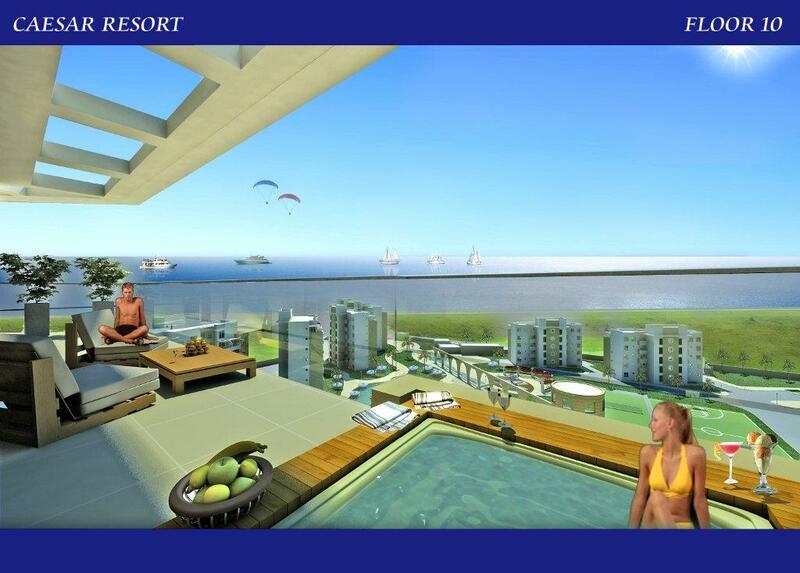 This presents a great opportunity to let your North Cyprus investment property year-round. The Caesar Resort have obviously thought of this, when they provide optional extra storage space for every apartment, just right for packing away your good stuff while the students are in. At time of writing, approximately 50% of the apartments are sold, with a good selection remaining across the price range. With the student population so close, the Caesar resort in Bogaz is well worth investigating for the business-minded North Cyprus property investor, especially since the Caesar Resort title deed is a TRNC Esdeger (Exchange) title. However, central heating, air conditioning and white goods are not included in the price, so you should budget for these for year-round occupancy. This web page is served on 20 April 2019 at 00:11:24.